An impressive effort in the 28th running of the TVG Pacific Classic that produced a record 12 ½-length margin of victory propelled Accelerate to honors as Horse of the Meeting and top older Horse for the 2018 summer season in a vote of the media. Trained by John Sadler for Hronis Racing LLC, Accelerate, a 5-year-old son of Lookin At Lucky, was kept in reserve while stablemate Catalina Cruiser won the Classic prep San Diego Handicap. 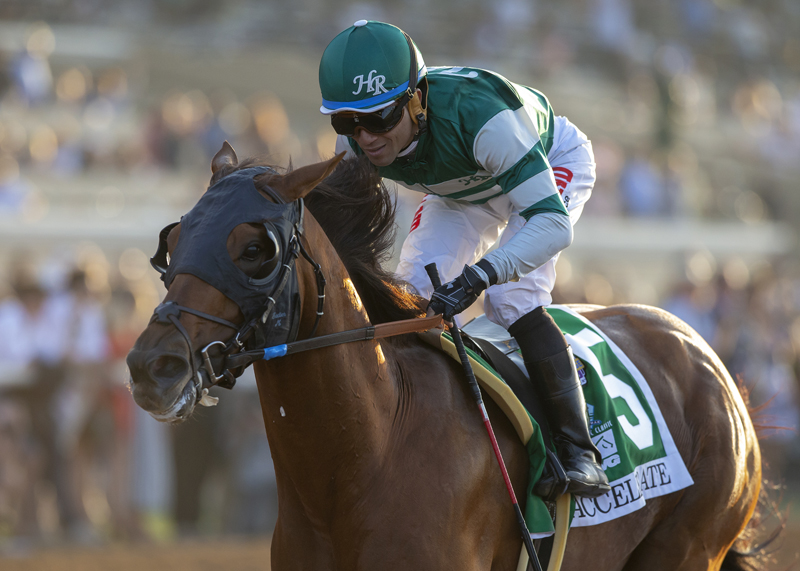 But when the time came in the $1 million TVG Pacific Classic, signature race of the 79th summer meeting, Accelerate was turned loose by jockey Joel Rosario and left his closest pursuers in the dust to better the existing margin of victory record in the race of 8 ½ lengths by Game On Dude in 2013. His first Pacific Classic victory secured, Sadler brought Catalina Cruiser back to win the seven-furlong Grade II Pat O’Brien Stakes and that victory swayed enough voters to gain Catalina Cruiser the top sprinter title by a narrow margin over Ransom the Moon, who won the Grade I Bing Crosby Stakes for the second year in a row. Accelerate and Catalina Cruiser were the only ones to receive Horse of the Meeting votes with Accelerate the solid choice. Bellafina, who defeated a stellar field in the Del Mar Debutante to take top 2-year-old filly honors, was the only unanimous vote getter in the nine categories. The others missed unanimity by four votes or less. Catapult, another Sadler trainee, gave the conditioner a third meeting champion, taking home top grass horse honors with Grade II victories in the Eddie Read Stakes and Del Mar Mile. Eclipse Award-winning Unique Bella threw a shoe during the running of the Grade I Clement L. Hirsch Stakes but prevailed by a half-length anyway to be voted the top older Female. It only took one Del Mar appearance, after last racing in the East, for the winners in the top 3-year-old categories. Fatale Bere erased the memory of an ill-fated trip to New York to win the Grade I Del Mar Oaks and be voted top 3-year-old filly. Trainer Mark Casse sent Ride a Comet on a cross-country journey from Saratoga, N.Y., to win the Del Mar Derby and be voted top 3-year-old. A victory in the closing day Grade I Del Mar Futurity, a record 14th for trainer Bob Baffert, put Game Winner in with the honored group as top 2-Year-old.